A simple DIY plywood window protection system can make a difference in keeping your home and possessions safe during hurricanes. 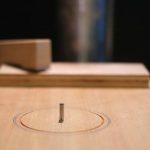 Using the right kind of plywood, along with sturdy barrel bolts, specially designed clips, or other approved fasteners is the best way to save money while preventing damage and aggravation. Pre-cut plywood window covers are available, but they’re much less effective than custom cut covers such as barrel-bolt plywood shutters. We’ll talk about using plywood for hurricane protection momentarily, but first, here’s what not to do. Some unprepared home and business owners have resorted to nailing or screwing plywood sheets over windows and doors when a hurricane is approaching. Don’t do it! This can lead to more damage, as poorly attached boards are ripped off by even moderate hurricane-force winds. This makes holes in window and door frames. The plywood panels also become flying missiles, leaving your property unprotected, smashing into things, and causing worse damage. Barrel-bolt plywood shutters are suitable for use on homes and other buildings fitted with windows that are inset by at least two inches. According to the National Oceanic and Atmospheric Administration (NOAA), barrel-bolt plywood shutters performed extremely well even during Hurricane Andrew. •	Exterior grade plywood sheets to cover all windows and doors. When using plywood for hurricane protection, the sheets need to be 5/8 inches thick or better. Some areas have even stricter requirements. •	Be sure to check local codes to ensure that the barrel-bolt shutters you build will be in compliance. •	Take measurements before purchasing your plywood. It’s a good idea to buy a little extra in case you made a measurement error or in the event a cutting mistake happens. • 3 to 4 inch heavy-duty barrel bolts: NOAA recommends placing one bolt at each two-foot interval. Other sources recommend placing bolts at six- to twelve-inch intervals. 1. The first step in making barrel-bolt plywood shutters is to prepare the plywood and the building. Be sure that you measure carefully to ensure the shutters fit perfectly. Poorly fitted shutters will not perform well. 2. Carefully take the vertical and horizontal measurements inside each window casing and subtract ¼ inch. Cut the plywood to fit. If a window is not exactly square, use its angle to make a custom plywood shutter without any gaping. A good fit is vital. 3. As you fabricate each panel, use a permanent ink marker to note which side is the top and which window or door it’s meant for. This will help you to install your shutter quickly when a hurricane is approaching. 4. Screw the barrel bolts to each edge of the panel. The more you use, the better protected your property will be. 5. Set the panel into place in the window or door frame. Mark the spot where each barrel bolt slides against the wall. 6. Once you’ve made your marks, remove the panel and drill the bolt holes into the window or door recess. Use a masonry or carbide-tipped bit for concrete or stucco walls, and ensure that the drill bit makes a hole that’s large enough to barely accommodate the bolt. You want a fit so tight that you’ll need to tap the bolts lightly with a hammer when installing the shutters. 7. Make larger panels by connecting pieces of plywood with 2x4s or piano hinges. This will make for easier handling, storing, and installation. If you use 2x4s, secure them to the plywood panels with screws at four-inch intervals. 8. When the panels are finished, extend their lifespan by waterproofing them with paint or varnish. Re-write your markings if needed, and store them in a dry place to prevent warping. Temporary window tension clips secure plywood to window casings without the need for screws or nails. They attach to brick, wood, and stucco, however they do not work on vinyl siding. Flush-mount anchors and hangar bolts can be installed to secure plywood panels in the event your windows and doors are not recessed far enough to accommodate barrel-bolt shutters. There are a variety of styles available, and each comes with its own set of instructions. 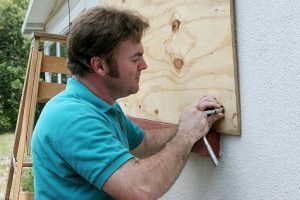 Be sure to follow these precisely to ensure that your plywood hurricane protection system works properly. As when taking measurements for barrel-bolt plywood shutters, take ¼ inch off your measurements. Also, be sure that you use water sealer on each panel you make, and mark the panels so that you know where to install them and which position to install them in. If you plan to make barrel-bolt plywood shutters or use a clip style system to install plywood for hurricane protection, purchase your supplies well in advance of hurricane season and build your shutters while the weather is good. Hardware stores always see a last-minute run on supplies when hurricanes are approaching. Be prepared and your home will have a better chance of surviving the next hurricane.